Worksnaps now works with Pivotal Tracker API V5, the newest API release from Pivotal. Pivital Tracker API V5 is an entirely new version of the API. It has switched the format from XML to JSON and has some modifications and enhancements to the last version V3. Worksnaps has now made the integration work with both the new V5 API as well as the old V3 API. We strongly encourage users to connect with the Pivotal Tracker using the V5 end-point. This can be set in Profile & Settings >> 3rd Party Integration >> Pivotal. You can simply set the Pivotal URL field to be https://www.pivotaltracker.com/services/v5 (the old V3 URL is https://www.pivotaltracker.com/services/v3). Everything else should stay the same and the integration should work seamlessly. Nowadays, thanks to faster Internet and improved online communications, more and more businesses are hiring remote workers. Many professionals are providing their services through remote jobs, which allow them to enjoy numerous benefits. Some of these include: a more balanced work and personal life, financial benefits (saving money on gas or fare), becoming more productive, avoiding traffic, and dealing with fewer office distractions. Offering remote work also benefits employers. When quality remote workers are managed properly, those who employ them can also expect to reap huge benefits. Some of the greatest benefits that remote work can bring to employers include: improved workforce productivity, reduced carbon footprint, and becoming more eco-friendly. 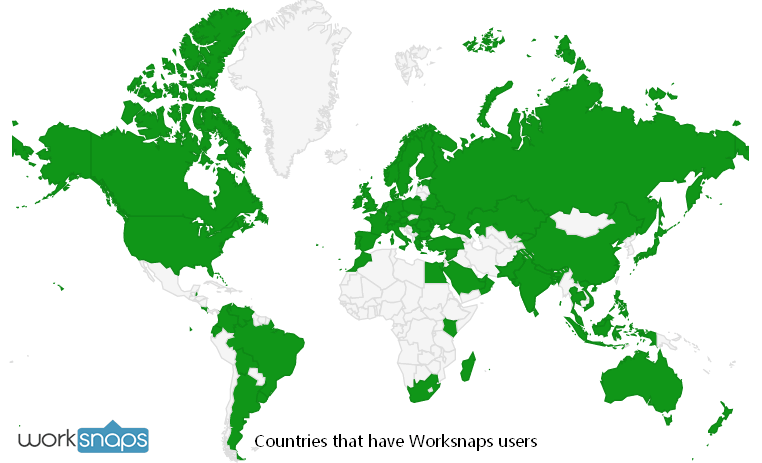 We are excited to announce that Worksnaps service is now being used by users from more than 80 countries around the world. There is strong evidence that more companies are turning to remote workers to augment their workforce, and online work has spread to many places around the world. While we see that we have strong user base in the traditional IT outsourcing hotbeds such as India, the Philippines and many parts of Eastern Europe, we are delighted to find users from countries such as Madagascar, Kenya, Andorra and Fiji. Meanwhile, we are also happy to realize that the time tracked on Worksnaps system has now exceeded 2 million hours. Back in January of this year, we reached the milestone of 1 million hours. It has taken us about 8 months to achieve the second million hours. We want to thank all the users, especially those who give us feedback, suggestions and constructive criticisms. We understand that the 2 million is just a number. The most valuable asset we have is our user community. We will continue to humbly listen to our users and enhance the product to better serve their needs.